I hope you’re up for one more city guide! As I mentioned in my last post, Victoria, the capital of B.C. located on Vancouver Island, really won us over. It felt a bit more relaxed and approachable than Vancouver and was certainly more our pace, having lived in Guelph for almost 6 years now. Even so, there is a lot to do within Victoria and the city has an excellent food, shopping and creative scene to check out. We’d always heard that Victoria was a bit sleepy but we found it to be full of action and a totally vibrant place to explore. Even in the short time since our first visit we noticed a big difference in the new places opening up and the general energy throughout. The neighbourhoods are beautiful and the downtown is bustling and peppered with lots of cute shops. There is no shortage of innovative menus, massive patios and all the fresh seafood you could hope for. 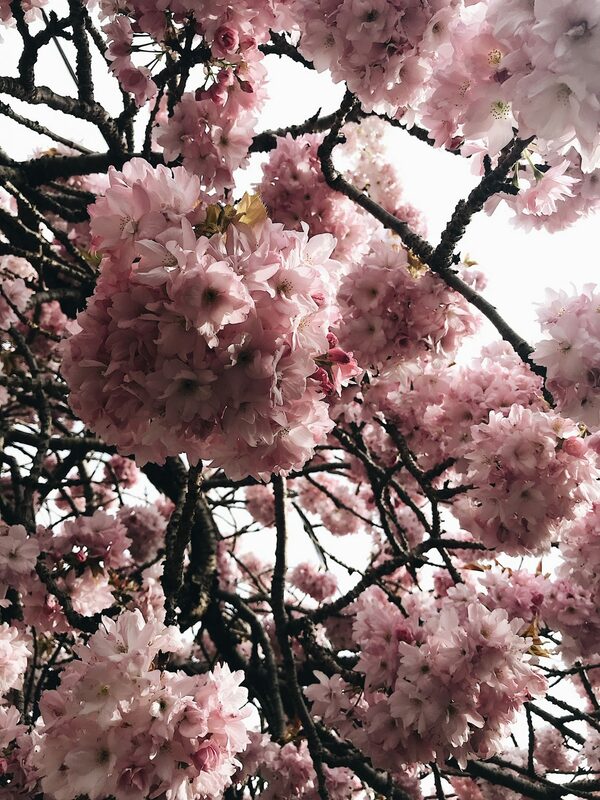 Plus, dare I say, the blossom season in Victoria is just as epic as Vancouver. We’ve only been able to spend a few days at a time on the island but she always leaves us wanting more! Of course, Vancouver is awesome, but if you’ve got a chance to hop over to Victoria for any length of time, I highly recommend it! Even the ferry ride over is a fun experience. So with that, here’s a look at the places we loved and you can scroll down for my list of What to Pack. SPIRAL BEACH – If you’re into skipping rocks and relaxing on giant driftwood logs, this beach is for you! Bring your morning coffee and a treat down for a perfect west coast morning. Just be sure to bundle up because she gets real windy! FINLAYSON POINT – Take a seat here to watch the ships float by or the sun go down and take in the epic, panoramic views of the ocean. MILE 0 – If you’ve ever wondered where the Trans Canada HWY begins, well, this is it! It’s also where Terry Fox was aiming to finish his cross-Canada run but as we know, sadly, he never made it all the way. 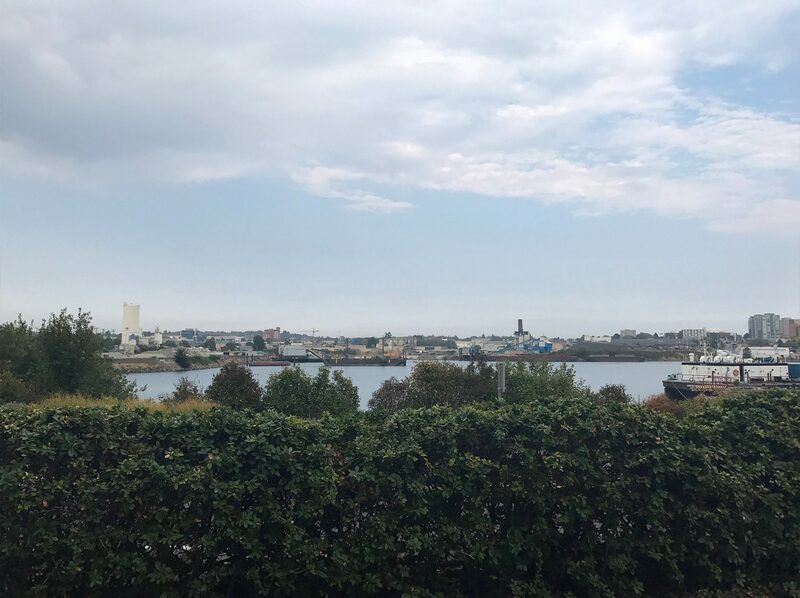 From this spot you can keep heading along Dallas road to Breakwater Cafe for a bite and walk out on the pier to see all the cruise ships coming in and out. 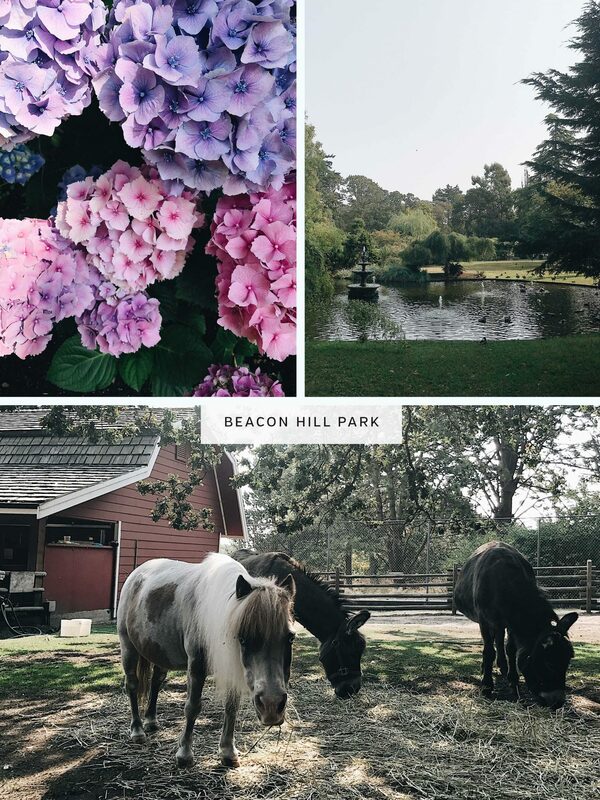 BEACON HILL PARK – Located directly south of downtown and leading to the shoreline this giant park is filled with pretty pathways, gardens, grassy spots, ponds, a little farm and lots more worth exploring! We always make a point to saunter through while we’re in town. COOK STREET – Located on the east side of Beacon Hill Park, Cook street village is a cute little stretch of shops, restaurants and cafés worth a walk through if you’re going that way. The neighbourhoods and homes in this area are quaint and lovely and have some of the most well cared for gardens I’ve ever seen! 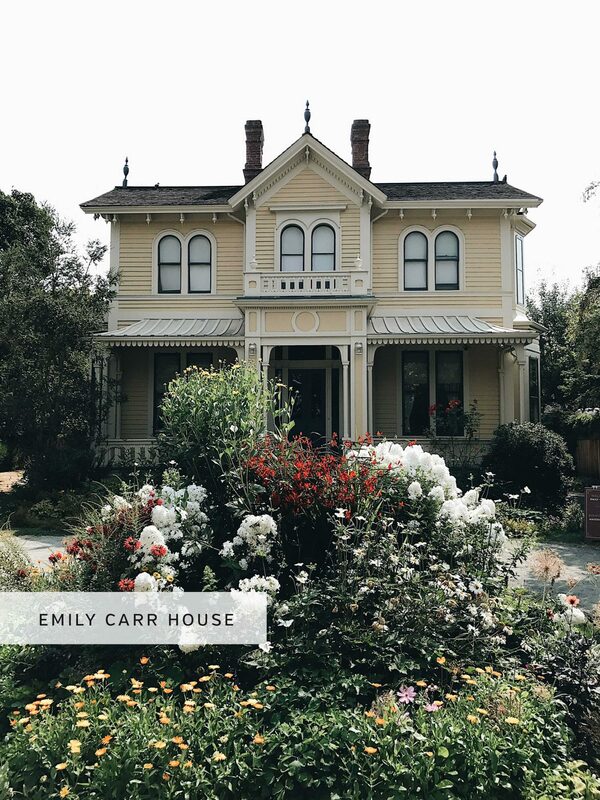 EMILY CARR HOUSE – This was once the home of Canadian painter Emily Carr. It’s worth stopping by for a quick tour ($6.75) and to see a key source of inspiration for her work. The house and grounds are lovely and it’s right on the way up Government St. from the shore to downtown. GOVERNMENT + WARF STREET – The walk up (or down) these two streets is lovely on a nice day and will take you up to downtown and then along the harbour. Keep in mind the closer you get to downtown the more these main streets become touristy. So much that I might even skip it on a sunny weekend day. 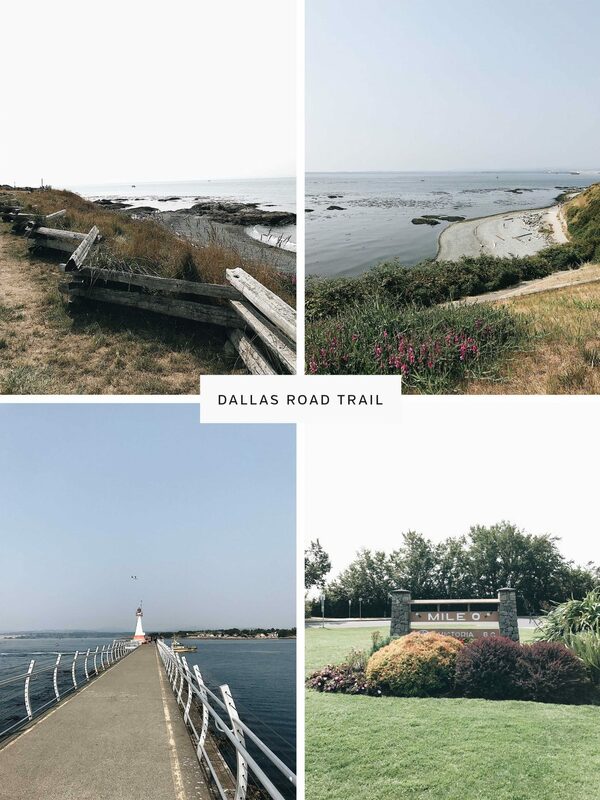 GALLOPING GOOSE TRAIL – If you’re keen on heading to West Victoria (which I highly recommend), take the Bay St. or Johnston St. bridges over and hop onto the Galloping Goose Trail. If you’re up for biking this is the perfect place to do that too! The trail will take you into Banfield park which is lovely and can even spit you out right in front of one of my all-time favourite shops, HOLD General. On the way back stop at Fantastico for a drink and charcuterie or pick up some goods for the road at Fol Epi. MOSS ST. MARKET – We’ve never made it to the market during our visits but if you’re in town on a Saturday from 10-12pm between May and October, it’s worth a visit to check out all the local produce and makers! 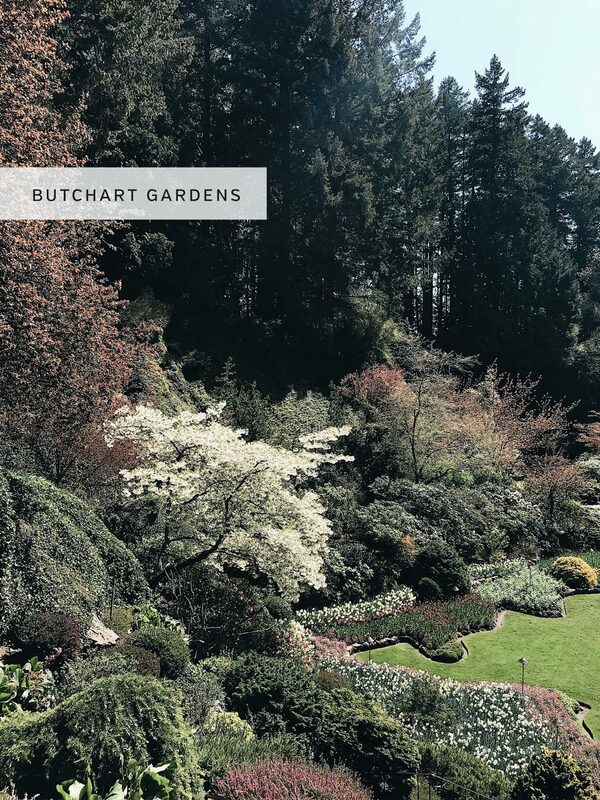 BUTCHART GARDENS – This one is about a half an hour drive (or 1 hr bus ride) out of Victoria city but so worth it if you’re a flower and plant lover like me. It’s also dog friendly which is great if your pup is with you. Learn lots more here. 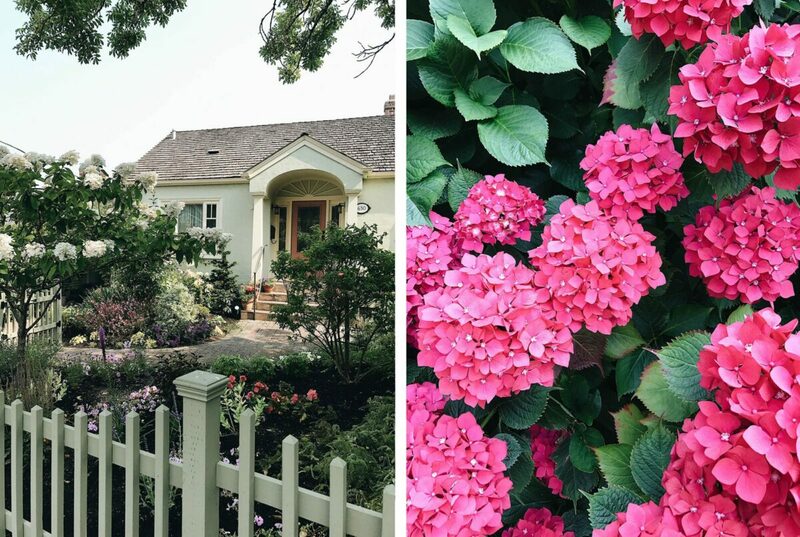 BEYOND VICTORIA – We loved driving up through Brentwood Bay and North Saanich (on the way to the ferry or airport) to see the gorgeous horse farms and land. Metchosin and Sooke are great spots to drive through with beaches to explore on the way to Point-No-Point (along the southwest tip of the island). Try to plan your route so you can cross the Coburg Peninsula! If you’re heading to Tofino you’ll likely pass through Cowichan Bay and Nanaimo before getting into major redwood territory. Consider stopping in MacMillan Park or trekking through Pacific Rim National Park Reserve. So much glorious natural habitat to savour but you’ll need some wheels to get there. 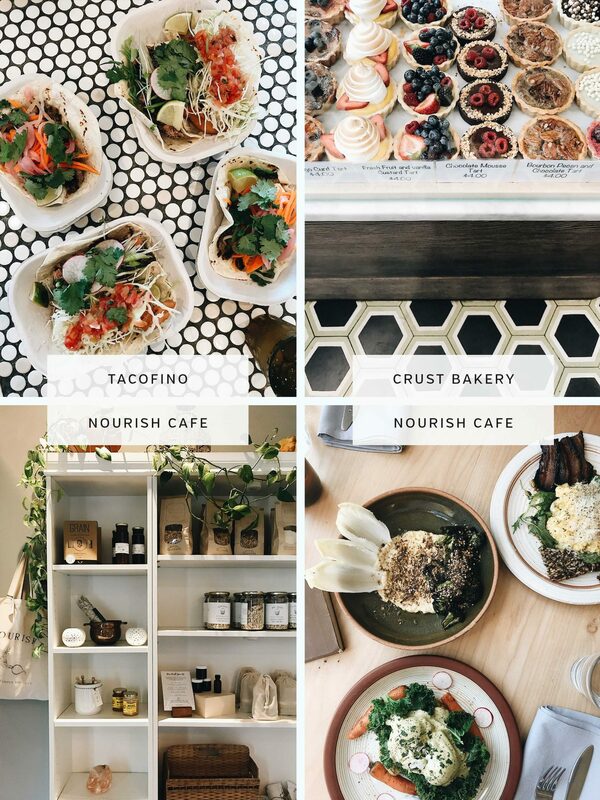 NOURISH – If you go to one restaurant in Victoria, let it be this one! It’s truly one of my favourite restaurants in the country. There is usually a bit of a wait but you can grab a coffee at the cafe and head upstairs or into the vegetable garden to take in the scene while you wait. RED FISH / BLUE FISH – Dockside seafood restaurant within an old shipping container. Lots of fun taco options, traditional fish and chips and the chowder is a must! FISH HOOK (Mermaid Wharf + Fort Common) – Indo-French influenced sustainable local seafood. Beautiful plating in a contemporary space with a great patio overlooking the wharf. The Fort Common location offers more comfort style options and takeaway if that’s what you’re after. JAM CAFE – A local haunt for Victoria folks offering all-day breakfast and updated takes on classic comfort food. Get there early or be prepared for a line-up. BLUE FOX – Vibrant, colourful cafe known for all-day breakfast & imaginative takes on Canadian comfort food. Similar to JAM, get there early or be prepared for a line-up. JOHN’S PLACE – Great option if you’re looking for a fun atmosphere and lots of great breakfast, brunch and lunch options. Think waffles, BYO omelettes, epic Benny’s and Tex Mex! BE LOVE – Modern takes on farm-to-table vegan cuisine & superfood cocktails. TACOFINO – Part of the same restaurant group as the one mentioned in my Vancouver Guide, this little taco haven is a great option for a downtown lunch on the go! CRUST BAKERY – If you’ve got a hankering for something sweet (I know I usually do!) and donuts aren’t your thing (I mean, HOW?) then be sure pop into Crust for some of the most beautiful little delectables! 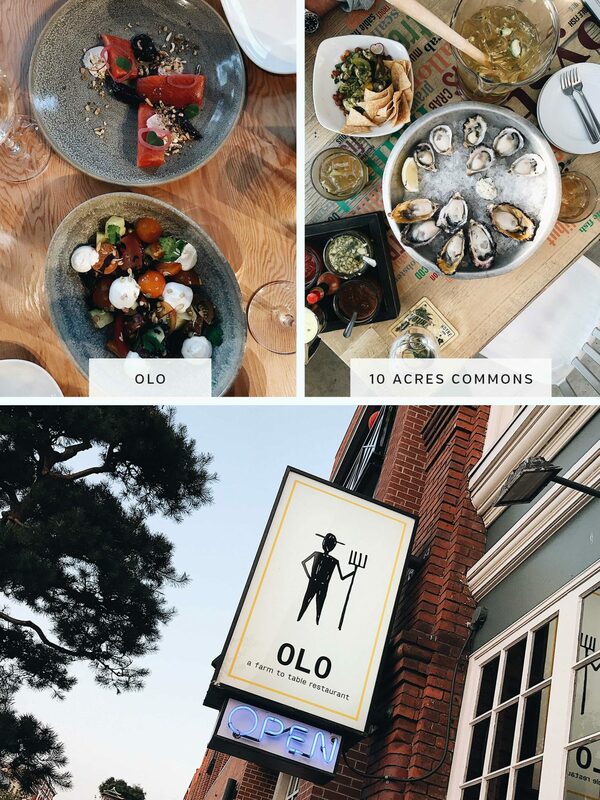 OLO – One of my favourite dinners in Victoria was at this restaurant. We had a wonderful walk along Wharf St. to work up an appetite and this place did not disappoint. The ingredients are locally and sustainably sourced, the space is small but open and beautifully designed and there is a lot of people and pup watching to be done as folks meander along Fisgard St. The wine we had was phenomenal and the servers were so well-informed about where each ingredient was from. Oh and the plates and flatware are GORGEOUS! If you’re at all inclined towards a special dinner out, make it this place! 10 ACRES Commons, Kitchen, Bistro – I love the concept behind this restaurant group as it is truly ‘farm to table’ since that’s exactly where their seasonal ingredients are from! Whatever the weather, we can be found growing organic vegetables, fruits and herbs 10 months of the year. Staying true to Farm to Table principles and practice, the farm supplies 10 ACRES BISTRO + KITCHEN + COMMONS with fresh eggs and farm meat. Our livestock are raised in grass pastures, enjoying non-GMO feed. Our recently planted orchard was a feast of pollen for the busy little bees which arrived in time to help pollinate all 43 varieties of our 17 different fruit trees last spring. If you’re up for Happy Hour cocktails on the patio hit the Commons. If you’re in the mood for a nice lunch or a sharing style dinner try the Bistro. If you’re after a more refined, tasting menu style dinner go for the Kitchen. CANOE – If you’re in the mood for a patio, made-in-house beers with killer branding (I swear it makes it taste better 🙂 and refined pub food, this is your place! 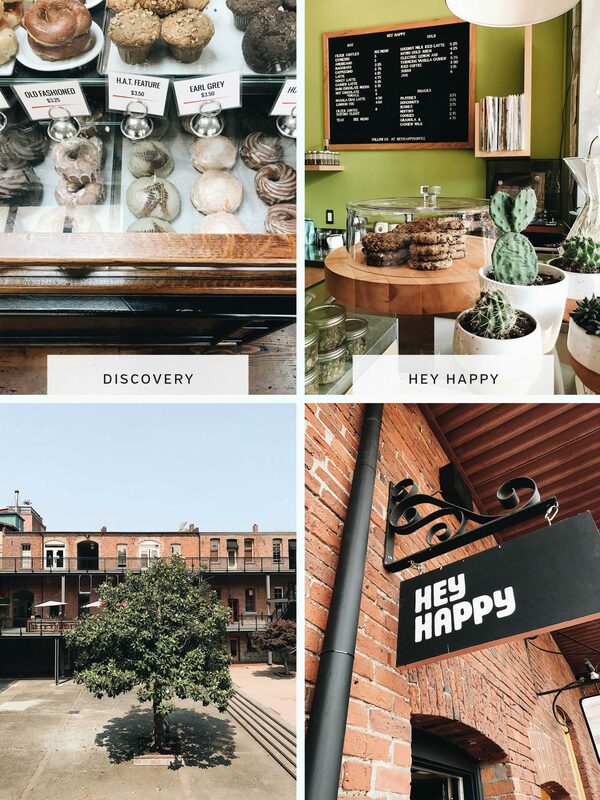 HEY HAPPY – Such a cute spot right downtown near all of the best shops (see my faves below). Be sure to take your coffee and treat out back for a view of the bustling market square. DISCOVERY – This is our go-to coffee shop when we’re in town as there are 3 locations and they all stock the amazing Yonni’s donuts! With 7 different brewing methods this is definitely a good option for any coffee aficionados out there. Discovery also roasts all their own beans locally and sells them in each cafe. We always bring at least one roast home when we visit. HOT & COLD – Another cute option in the Cook St. zone with lots of great options for treats and a little sidewalk patio for working or people watching. I’m sure there are lots of other coffee shops worth visiting too but these are the few we’ve enjoyed each time! HOLD GENERAL – I’ve said this before and I’ll say it again, this store is one of my all-time favourites! I had the pleasure of meeting Marla, Hold’s owner and visionary with impeccable taste. It’s well worth the walk or trip over to Victoria West just to come here. Take the Galloping Goose Trail and stop into Hold’s neighbour Spiral Cafe for a pick-me up or grab some baked goods from Fry’s Bakery for a picnic in Banfield park across the street. STILL LIFE FOR HIM + HER – I haven’t actually been into the Victoria location of this indie label mecca but the one in Vancouver is fabulous and you can find so many incredible lines here. Think St. Agni, Paloma Wool, First Rite, Ali Golden and the list goes on! 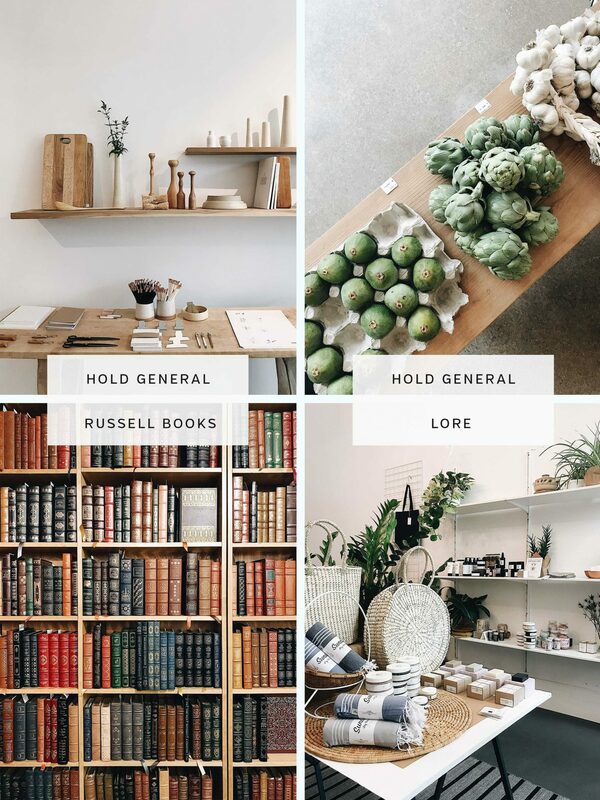 LORE – A great spot for house plants, home goods, apothecary, basket bags, hats and gifts. Trust me when I say it will be hard to leave this beautiful little shop empty-handed. RUSSELL BOOKS – As lifelong lovers of print and books this was a fabulous spot for Dave and me. The antique side of the bookstore is particularly wonderful and the smell of aging books is one of my favourites. PIGEON HOLE – This gorgeous shop has always been a little far afield for our schedule but I’ve been dying to visit. The space looks beautifully curated with a mix of antique gems and new pieces, perfect for a thoughtfully built home. VINTAGE FUNK EMPORIUM – There is definitely lots of great thrifting and vintage hunting to be done in downtown Victoria. We have always been pressed for time so I haven’t explored too many spots but this one looks like a good spot to start! 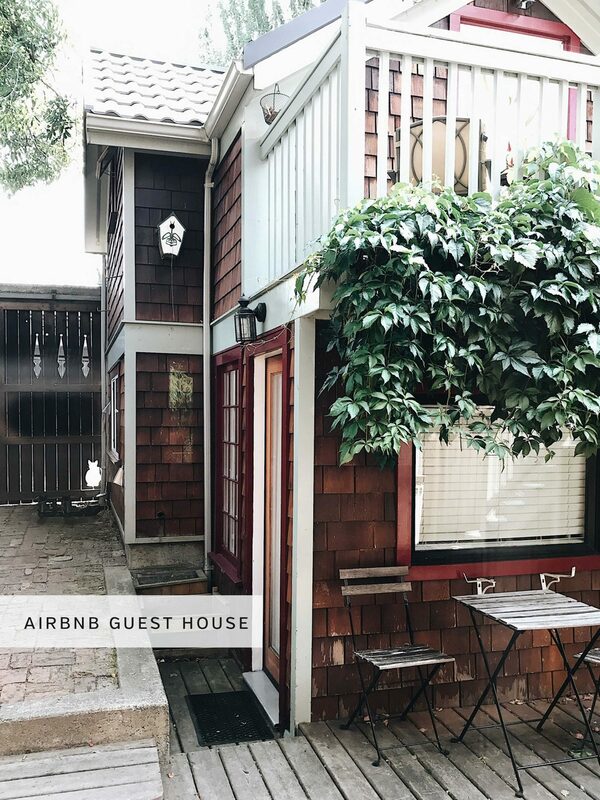 AIRBNB – There are so many great carriage houses that Victoria residents rent out. Just look how cute is this one is! Aim for downtown-ish or near Beacon Hill Park for easy access to the parks and coastal trails. Sadly, I couldn’t find the AirBnB listing from our visit. HOTEL ZED – While a bit farther north than I’d love it does look ridiculously fun to stay at and very reasonable! + Pet Friendly! MAGNOLIA – Definitely a more luxurious option, but so lovely and in an amazing location for getting to all my favourite areas. Apparently the spa is excellent too. + Pet Friendly! I absolutely love how walkable Victoria is and highly recommend exploring on foot. Plus, that means you can stop along the way for tasty treats more often! Luckily the weather is usually not as rainy as Vancouver but it tends to be on the cooler side in general and it certainly gets windy by the water. Layers are key and so is a bag to store extras when you’re further inland where it feels significantly warmer. I dressed up a bit more for dinners and exploring in Victoria but I definitely kept simplicity and comfort a top priority. 2 | BIG SCARF | Always a travel essential no matter where I’m going. I love bringing a giant scarf in a lightweight fabric that I can bundle up around my neck when needed, where as a shawl on a warm night or style a zillion other ways to keep my outfits feeling fresh. My favourite prints are from Block Shop Textiles but I also love the Scarf Shop and Cuyana for simpler options. 3 | WHITE SNEAKERS | Never a bad idea to pack a classic pair of white kicks, especially if you plan to be walking a lot. I love my VEJA sneakers but Allbirds is also an awesome option. I brought flat slides last time and wished I had my sneakers instead. 4 | COMFY JEANS | Because Victoria is usually on the cooler side a good pair of jeans will surely come in handy. Then you can leave the layering to your top half. 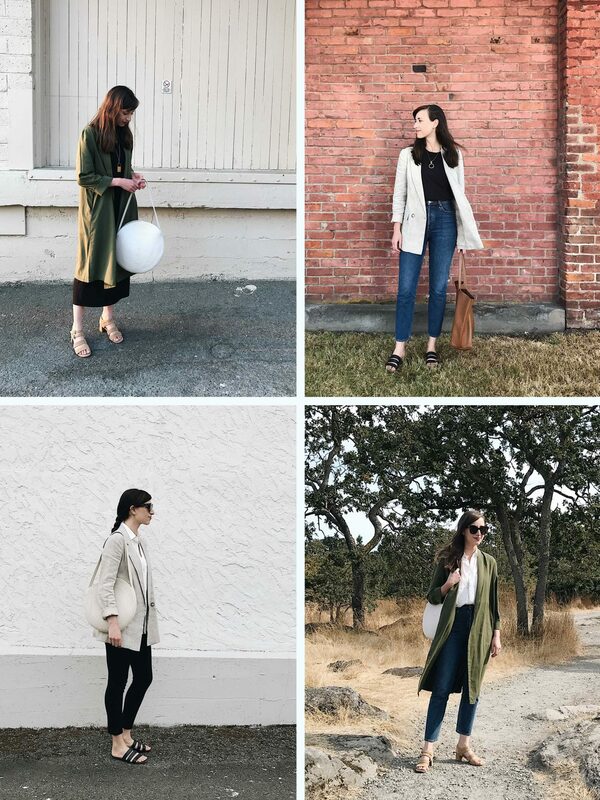 AGOLDE and Everlane make my personal favourites. 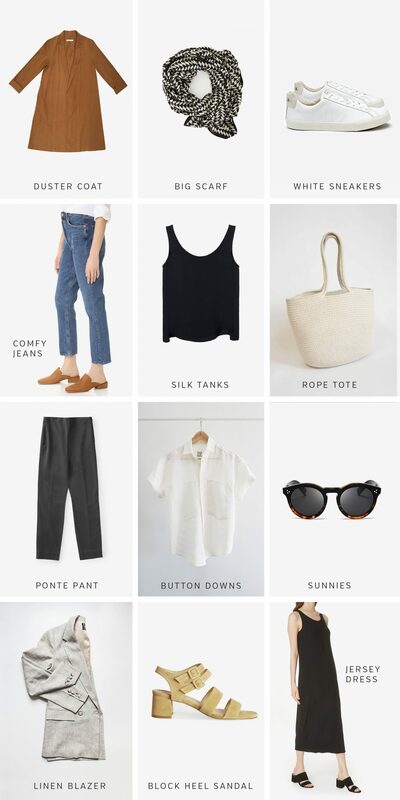 5 | SILK TANKS | Silk tanks are a great travel staple because you can easily steam them smooth (while you’re in the shower) and they can be worn on their own when it’s hot, under an open shirt when it’s milder and under a blazer or a duster when it’s chilly. I love my Tunic and Boxy Shell from Eileen Fisher. 6 | ROPE TOTE | Got to love a tote that’s both functional and sculptural! This one is from Etsy where you can find tons of great travel bag options. 7 | PONTE PANT | When you’re in need of some stretch or planning to be quite active pull on a pair of ponte pants and throw over a simple top and a cute coat and you’re set! BRASS makes the crown jewel of Ponte Pants but Everlane has a good-looking option too. 8 | BUTTON DOWNS | Another great travel staple. Wear it loose, tucked, tied or open. Cuff the sleeves, play with the buttons, you won’t find a more versatile travel shirt. My favourites are from Power of My People and made in BC! 9 | SUNNIES | Skip the eye make-up and just throw on a killer pair of shades. You’ll be out the door and onto exploring much faster that way and there’s a good chance you’ll need them all day! I picked this pair up during my west coast visit and they’re the comfiest I’ve ever worn! 10 | LINEN BLAZER | My go-to summer topper for an evening outside. Reformation makes the best fitting blazers and you can see them all here. 11 | BLOCK HEEL SANDAL | Maybe it’s just me but when I’ve been wearing sneakers all day I like to switch things up for an evening out. A block heel sandal is still super comfortable for walking along the pier or through the park at sunset but you’ll feel much more sophisticate for cocktails and dinner! Marais should be restocking soon and I can attest to the comfort of the Jardin Heel after over a year of wearing them! 12 | JERSEY DRESS | This is my go-to option when I want to look sophisticated without sacrificing even an ounce of comfort. Paired with a block heel and duster coat, you’re ready for anything a night on the town may have in store! Yes these are from last year when my hair was long. I didn’t get many outfit shots during our recent visits and I was basically wearing the same thing anyway! AND THERE YOU HAVE MY VICTORIA CITY GUIDE! Thanks for reading! Next week I’ll be back to share my West Coast Wear Count Part 2! Perfect guide including all of my favourite haunts! Of course I love to frequent so many of the coffee shops (including Hey Happy and Discovery), next time you come you should check out Branch, Cafe Fantastico, Hide and Seek coffee and the Parsonage. Also, Empire Donuts, Kid Sister Ice Cream and Cold Comfort are pretty special places for treat too! Love your blog! I’m finalising my itinerary for my August trip to Canada and I’m reading and re-reading this guide and your one for Vancouver with growing excitement. So many great ideas and fabulous information. I love that some locals have added ideas for me to research too. I’ll be leaving a Canberra Winter for three fabulous weeks of late Summer/early Spring so your packing tips are wonderful and much appreciated too. I can’t wait! Looking forward to the West Coast Wear Count Part 2 this week. I loved reading through your guide of Victoria. You know so much about it from your visits here, you truly sound like a local. What’s more, what with all the beautiful dog-friendly spots, the excellent food and coffee, and lovely boutiques, I think you need to move here! I thought I’d pass on a few more of my favourite places to go and things to do for your next visit. 2. If you stay at Hotel Zed, the restaurant in the hotel The Ruby is aMAzing. The Ruby also has a more central downtown location on Johnson Street. 6. You will love Pigeonhole. It’s gorgeous. Hope this is helpful and thanks for your blog, I’m a fan. I’m glad you did make it over to the island for a visit! You certainly have been thorough in mentioning great places to eat/shop and your advice re clothing to bring/wear was spot on 🙂 If anyone is visiting Victoria and hasn’t brought the right wardrobe (can be challenging because our temps can change a lot between AM & PM), drop into the Hemp & Co clothing shop right downtown on Government St. – they carry ethical clothing that syncs closely with what you recommend in your posting. And while at Hemp & Co. you should check out Roberta’s Hats right next door – she has the most beautiful hats anywhere 🙂 (I’m not affiliated with these businesses at all – I just like to shop at them!) Thank you for posting such a great write-up about Victoria – it was fun to read and view!